Opened in 1938 the Ocean Hotel occupied a site of around 4 acres with 344 bedrooms and a dining hall that could seat 300 people. It consisted of a main building shaped like a crescent which contained the whole of the public rooms and some of the bedrooms, and there were six other buildings which contained bedrooms and bathrooms only. The hotel was so arranged that during the winter season the six detached blocks could be closed down and the main building, with its 130 bedrooms, run as a separate hotel. An outdoor swimming pool (later enclosed) was built between the buildings. During the war the hotel was taken over by the Auxiliary Fire Service and later became a fire service college which was officially opened by the then Home Secretary Herbert Morrision. It was used throuhgout the war and was not handed back until 1952 when the lease was acquired by Billy Butlin for £250,000. Its doors were opened as a holiday centre again on 2 May 1953, after an army of workmen had spent the previous six months restoring the near-derelict building. 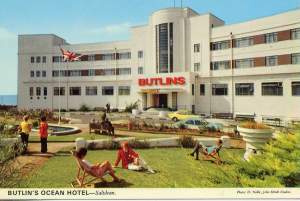 It soon became popular with honeymooners and Billy Butlin later said the hotel was one of the best investments he'd ever made. Sold in July 1999 to the Grand Hotel Group the hotel remained open until January 2005. Planning permission was granted in June 2005 to convert the site into apartments. The main building, which is Grade II listed, will be refurbished with apartments upstairs and commercial/community facilities on the ground floor. The remaining buildings have been demolished and are being replaced by 4 new residential structures and parking. Thanks to Ron Stanway for supplying the following poem which was written by Wayne Slater for the closing down dinner at the hotel. Farewell to the Ocean Hotel, December 2004. With all my memories I've got stowed. Oh, what secrets this place holds. Then make that moment last forever. As are the moments we've shared together. Of which, I was so proud. Then surely, that, was my moment. For the 'Oceans' at its end. Let us drink to long lost friends. But never forget those moments. Whilst the Ocean danced around our feet.